Multiple entries and incorrectly submitted entries are automatically binned! Courtesy of Metrodome Entertainment we have three copies of the brand new Region 2 dvd of DARK FLOORS to give away. 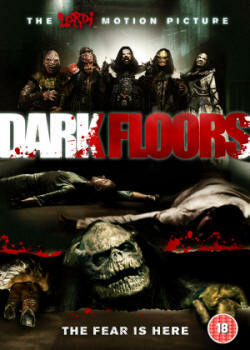 DARK FLOORS is a terrifying supernatural horror in the vein of Resident Evil and The Devil's Rejects, written by and starring the infamous hard rock band LORDI. To win a copy, all you have to do is send an email to darkfloorscomp@avalard.com. Include your Name, Age, and Postal Address (so we know where to send the dvd if you win). The competition closes at 5pm (GMT) on 12th May, after which we'll draw three names from a hat. You can buy DARK FLOORS on dvd in the UK by clicking here. Sarah is an autistic little girl whose father is worried about her health. Concerned for her, the father sees her removal from the hospital by force as the only option. An elevator breakdown prevents a smooth exit and leaves them trapped with a group of others. Yet the incident is only the beginning of a descent into nightmare. As the doors open the hospital appears mysteriously deserted. When mutilated bodies are found, creatures from a dark world start a frightening attack. It soon becomes clear that the survival of the group may rest solely on the little girl. In the same vein as ‘The Ruins’, ‘The Devil’s Rejects’ and ‘Resident Evil’, ‘Dark Floors’ is set to be the one of the most terrifyingly bloody monster horror films of our time. Courtesy of Metrodome Entertainment we have three copies of the brand new Region 2 dvd of MANHUNT to give away. Inspired the popular video game, MANHUNT is bloody, violent, dark, gore-infected horror, and unleashed uncut on 30th March 2009. To win a copy, all you have to do is send an email to manhuntcomp@avalard.com. The competition closes at 5pm (GMT) on 18th April, after which we'll draw three names from a hat. You can buy MANHUNT on dvd in the UK by clicking here. One of the most shocking and talked about horror films of the last decade is unleashed in all its bloody, visceral UNCUT glory.